Dawn arrives late in the middle of a jungle. The golden rays of the morning sun get effectively blocked by the tall trees all around. I open my eyes after a very peaceful night’s sleep. Its is still dark outside. Yet I am awakened by the chirping, cooing,squawking, hooting and warbling, going all around me. It is fascinating to hear the bird songs so clearly, and so early in the morning. I look out of the window. I see nothing. Well above me, I can trace the first faint bluish tinge in the eastern sky. I remember that a very interesting visit has been planned today to a nearby site. After a hearty breakfast, consisting of some fabulous local dishes along with bread and omelet, we leave the resort for our day’s excursion. The morning is rather pleasant , though I would have preferred a slightly lower temperature. 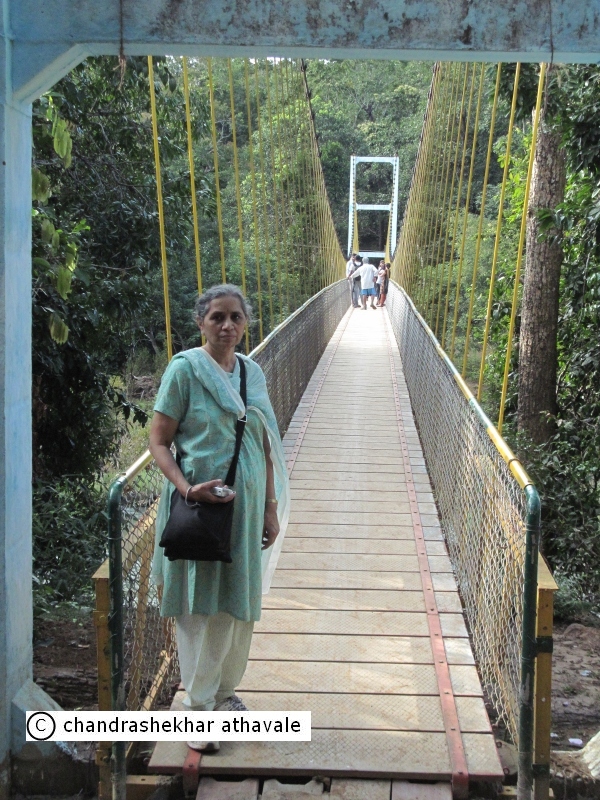 We take the Yellapur-Sirsi road, a narrow and much pot holed path. The Sirsi town is just a medium sized town with fairly modern facilities like hospitals and even a sports stadium. There is a state highway No. 69 which joins Kumta town on the sea shore with Sirsi. After traveling on this highway for about 40 kilometers, we branch of to a much smaller road (single lane at the best.) This road passes through some of the dense jungle patches on the Sahyadris. After rattling and bumping for about 10 kilometers, the vehicle comes to a stop. There is no motorable road any further. I get down and look ahead. There is a path straight ahead, sharply sloping downwards. It must have rained here last night because soil is completely wet and slippery. The dense forest around me has still retained that moisture in the air and I feel very damp and sticky. I start walking down the slippery path with abundant caution, firmly keeping my eyes on the ground. After some distance, the path curves to left. On the corner, I locate a dry spot. I decide to pause there for few seconds and look up. In front of me, stands a most amazing spectacle, I have ever seen. Behind the thick undergrowth of the jungle, a jet black rock with a cragged and pinnacled shape rises above the trees. 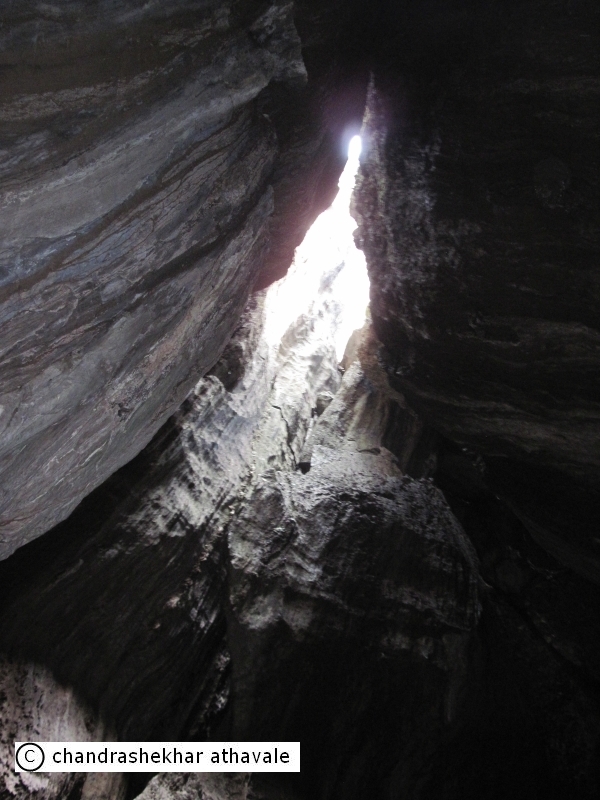 The rock is huge and has muliple sharp crests, crevices and cracks going down all the way, well below my sight. The crests and cracks, having faced the weather for ages, are rough and absolutely razor sharp. I have seen such kind of rock shapes only in sci- fi- book pictures as that from some other planet and had never even imagined that such kind of rock pinnacles can really exist anywhere on earth. This rock, except for its black shape, looks as if it has just come from some other planet. 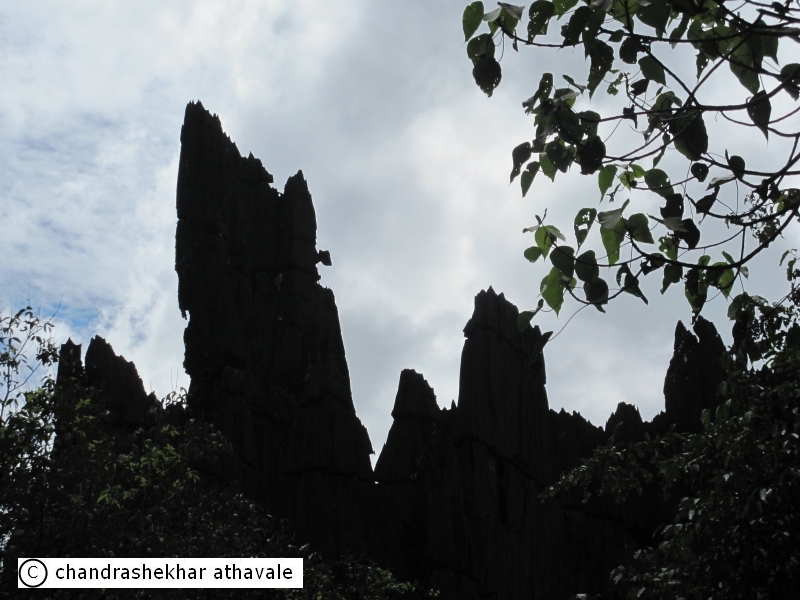 This craggy rock is called by the local people as Mohini Shikhar or Mohini Peak. I continue walking. Few meters away on left, the land becomes flat and on this flat land stands a magnified version of the smaller Mohini peak. This is the rock, known locally as Bhairav shikhara and rises 120 meters feet above the ground. The smaller Mohini shikhar rises to a height of 90 meters. This large pinnacled rock rises from the hillside over the tree tops, like the battlements of a castle. 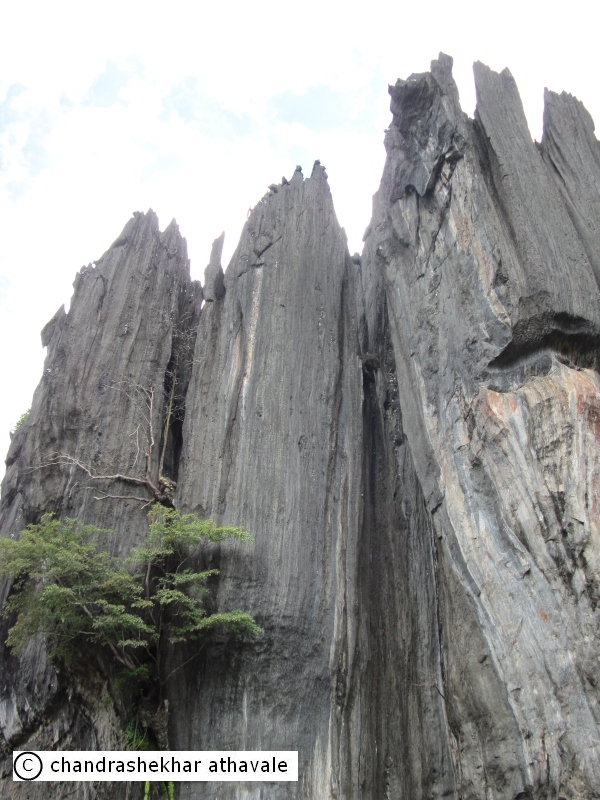 The nearest village from this place is called Yana and hence these pinnacles are commonly called as Yana rocks. The Sahyadri mountain range mainly consists of black basalt rocks formed from solidification of Lava from an ancient volcanic eruption about 65 million years before. Surprisingly both pinnacles at Yana are pure crystalline limestone. Such rocks are usually formed by decay of marine animals or by crystal formation of calcium salts dissolved in water. 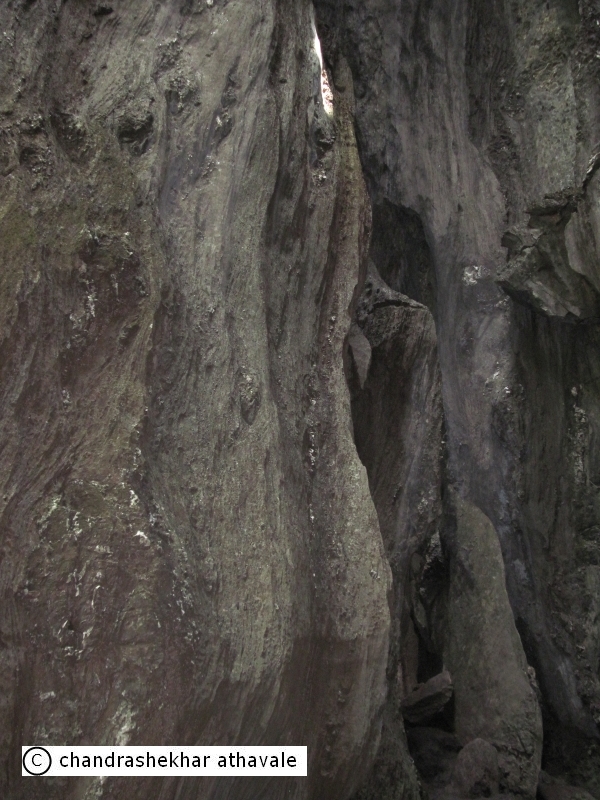 Such ragged pinnacles formed by dripping water are found inside caves at many places around the world. 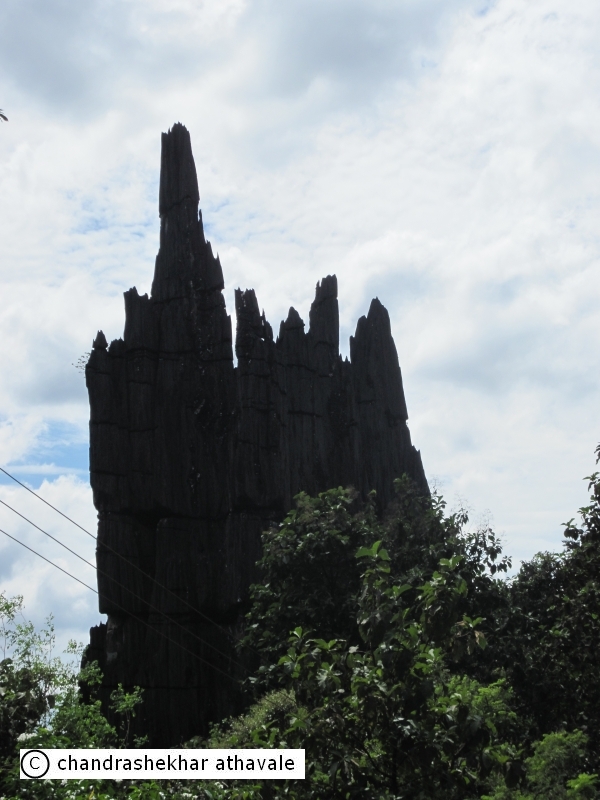 The presence of such huge pinnacles on the ground and that too having jet black colour is a real natural wonder. The flat piece of land where I stand, ends at about mid way in height of Bhairav pinnacle. There is a natural cave formed here inside the rock. A shiva temple with a Linga has been built inside the cave. I have a casual glance at it and come out to photograph the rock. 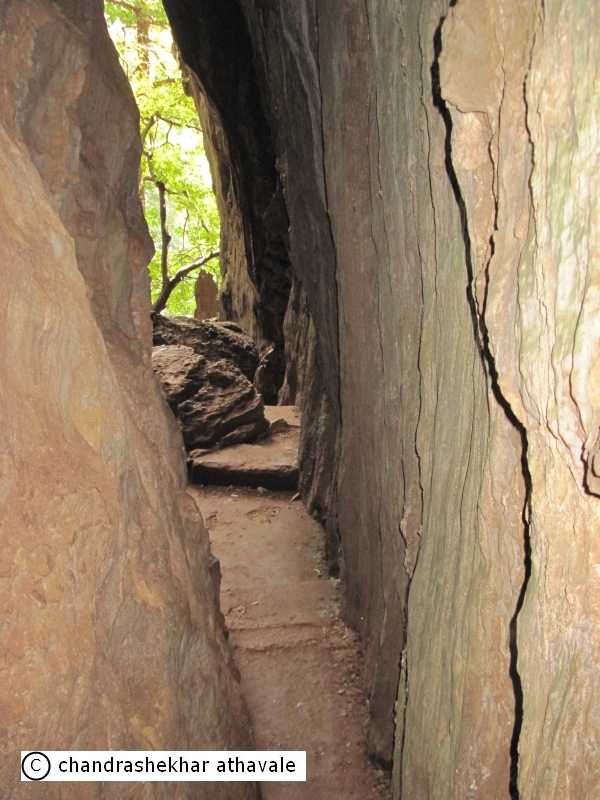 From the left side of the rock a path with built in steps, leads to a great horizontal gap or a cave like fissure. Since this rock is considered as some kind of religious place , one needs to remove his footwear to go up the steps. The walking surface looks rather rough and someone cautions me about the Leeches that are in abundance around the rock. Even then, having come here all the way, I just cannot avoid the temptation of an adventurous journey through this cave like structure. I remove my footwear and climb the first few steps. After climbing for some distance, I stand facing the cave, which is actually a deep crevice and I happen to be at the bottom of it. 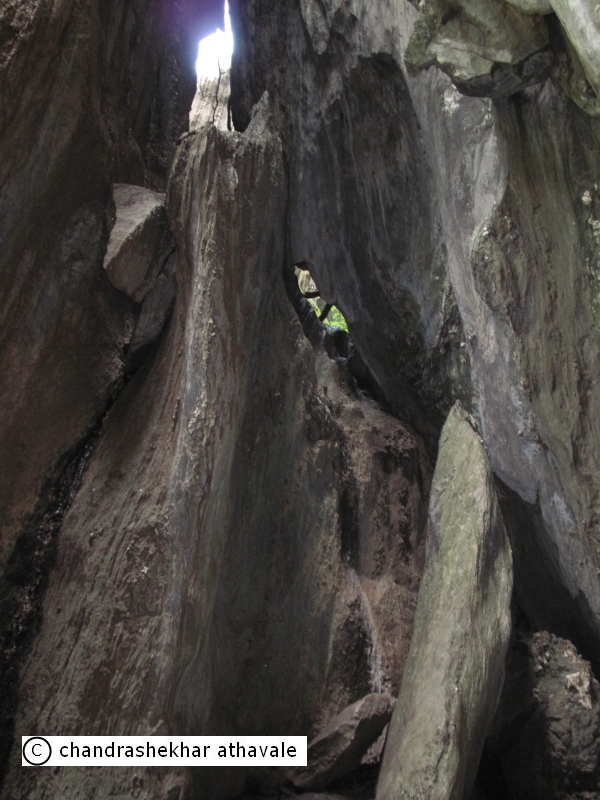 This fissure or cleft in the rock, actually almost splits the Bhairava Pinnacle into two halves. I walk into the cave. At few places the top is open to sky. At few places it gets closed with oval shaped openings bringing in bright sunlight. Even then these holes in the roof are at such an height that inside the crevice the air is still stuffy and smelly. The sides of the cave have deep vertical ravines or hollows with razor sharp edges. There are plenty of horizontal ledges which form a natural pathway for walking through. I can see many bee combs hanging from ledges at much higher level. A flock of bronze coloured flying creatures ( I really can not tell you whether they are bats or pigeons.) make a noisy exit. I keep walking. After few turns, the cleft becomes so narrow that I can barely walk through. There are few tall steps formed naturally by rocks. The going gets tougher and tougher. After doing about 80 to 90% of the round, I finally give up and return back. While returning I do see some beautiful white flowers on the side rocks. This place, as it happens with almost any natural wonder in India, has a mythological story. Naming the smaller pinnacle Mohini, which means a temptress, really beats my imagination. Who would be tempted by this jagged and ragged pinnacle? except may be few geologists or rock climbers. I keep my thoughts to myself and return to our vehicle and then to our resort for my lunch. After lunch, we start again, in another direction, to visit another wonder. This time not a natural wonder but something created by human hands. I am back again on the Sirsi-Yellapur road. About 17 kilometers from Sirsi, a small road branches off towards Hulgol village. We take a turn and continue for a small distance. Ahead of us is a neat parking place for vehicles surrounded by trees from all sides. There is also a small shop on a side, selling cold drinks and snacks. Obviously this is some kind of tourist place. There is a small opening in the trees, where steps have been built to take you down on a steep slope. I start walking down the steps. The steep slope turns out to be a bank of a river. After walking number of steps I manage to reach the river bed. The river does not have much water and hundreds of rocks and stones from the river bed lying bare. Yet, when I look closely at the rocks and stones, first with my bare eyes and later through my binoculars, a feeling of amazement fills my mind. Some one has converted hundreds of these rocks, into lingas of God Shiva accompanied by his bull, Nandi. 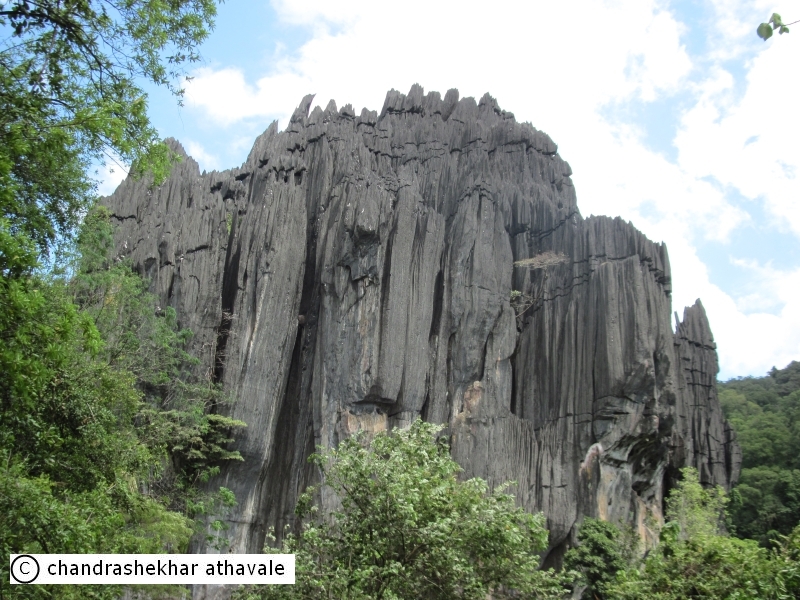 This place is known as Sahasralingam, which literally means thousand lingas. This river is known as Shalmala. This river originates somewhere near Dharwar and joins the Arabian Sea on the west. The spot is really beautiful and well deserves a visit. 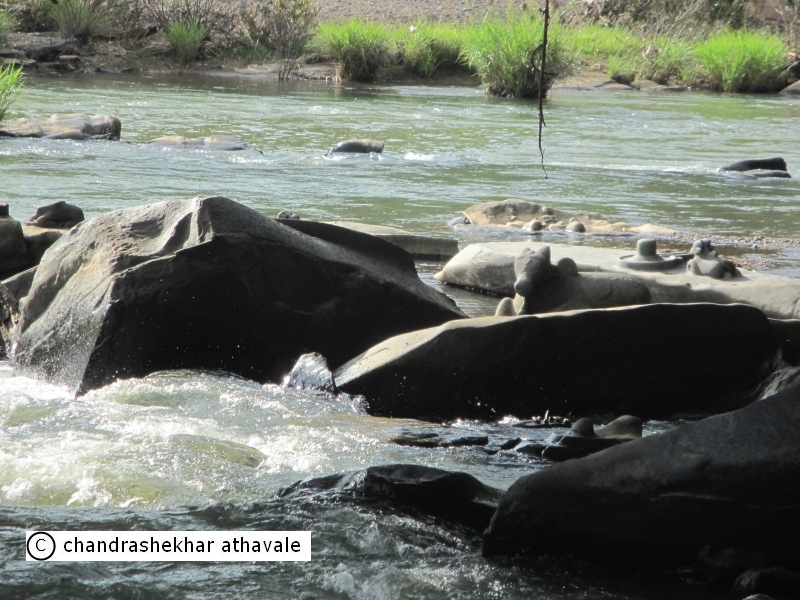 Yet no one knows for sure, who carved out these many lingas and the Nandi bulls in the river bed. However it is known that this place belonged to the king of Sonde, a place nearby, which now is just a village. Only sign of this ancient kingdom today is an old fort lying in ruins nearby. This King of Sonde had invited 29th successor Guru of one Vishvavandya Sarswati, who was appointed by Great Hindu Guru Shankarachraya at Kashi (Benares) as Guru of Havig Brahmanas of Gokarna temple, to come to this place and settle down. The Sonde king built a monastery for him and endowed it with land . This 29th Guru and his successors lived at this place quietly. This place was known as Sahasralinga even then because of the natural shapes of rocks in river bed, which looked like Linga of Shiva even in those times. 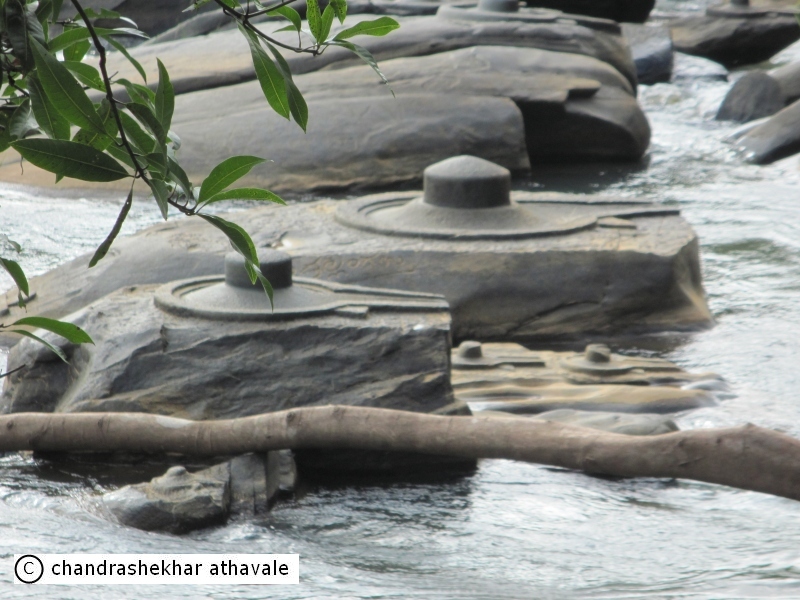 It is obvious that for a long time people from this Math or monastery must have commissioned sculptures to create Shiva Lingas and the bulls in the river bed, so that these look more authentic. Whatever may be the true history, no one can deny the fact that this place is an extremely beautiful natural picnic spot. The local government has now built a suspension or a hanging bridge at some distance. An excellent vies of the river bed is available from the bridge. After so much of site seeing in a day. I am feeling tired no doubt. I decide to have some Tea, hot, sweet and milky, in the true Indian style. The Tea, even in this hot weather, refreshes me and I am ready for the next spot on my itinerary.